Los Angeles, Sydney, Ko Samui - all beautiful places, but so far away. Although long-distance travel is popular, many people are horrified by the long flight that such a long-distance trip brings with it. 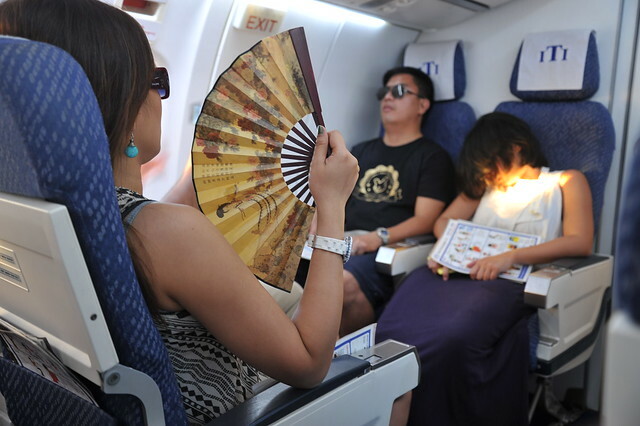 According to statistics, every fourth person feels a slight discomfort when flying. The legs start to hurt from sitting for a long time, the back and neck also pinch and the skin feels dry. But there are many things you can do to make your flight as pleasant as possible. When sleeping in an airplane, time not only flies by, but the traveller also arrives rested at his destination. But while some can fall asleep as soon as they are on the plane, others have great problems to calm down. It is important to find a comfortable sleeping position. In addition, travellers should always take a crescent cushion with them - this supports the head and prevents tension in the neck and back. Many also take a pillow with them to make themselves as comfortable as possible. Health products such as certain models filled with herbs also have a calming effect on body and mind. In order to be able to sleep undisturbed, sleeping glasses and earplugs must not be missing - this protects you from light and noise. Travellers should also remember to bring warm socks in hand luggage and ask staff for a blanket. Long distance flights are a challenge for the body. Due to the low humidity in the cabin, the body dries out faster than usual. It is therefore important to drink a lot on flights, but to refrain from alcohol. If you do not take in enough fluids, you will quickly feel uncomfortable and get dry skin and itchy eyes. Experts recommend drinking one glass of water per hour. Wearers of contact lenses should wear glasses or carry enough eye drops during the flight. The face and hands should be creamed with a moisturizing lotion and lip balm applied regularly to counteract an unpleasant feeling of tension. The feet fall asleep, the back tweaks, the neck is tense and the risk of thrombosis increases - long-distance flights can be a real ordeal for the body. Therefore, it is important to get up regularly and to exercise sufficiently on board. There is enough room in the back of the galley or emergency exit to do some stretching exercises. Stand on your toes and swing slightly, let your shoulders circle, stretch your head to the left and right - even small movements relax your muscles and let the blood circulate better again. In order not to get bored on the long journey, one should make preparations: Pack headphones, charge smartphone and pack spare batteries. If you don't feel like the airline's entertainment programme, you can download episodes of your favourite series, films, audio books or podcasts in advance and then watch or listen to them offline on the plane. If you travel with friends or family, you can pack a pack of cards to pass the time together.